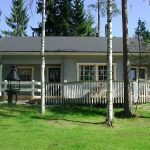 Ylä-Saarikko has six cosy cottages to offer, ranging from traditional ”mökki” to state of the art luxury cottage. All houses are built in log-cabin style and have their own sauna, a fireplace and their own stretch of beach at the lake. Additionally there are a separate sauna cabin and barbeque cabin which you can rent. The cottages are located at a private driveway and are built to guarantee privacy. 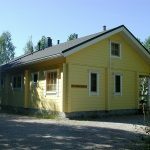 The names of the cottages are Villa Velhoranta, Virranranta, Salmenranta, Lummeranta, Laskuniemi and Ninnunlahti. 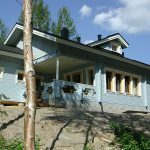 Laskuniemi and Virranranta are traditional ”mökki” and house comfortably 2-6 guests. 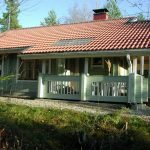 Villa Velhoranta, Salmenranta, Lummeranta and Ninnunlahti are larger and better equipped cottages. All cottages are well built and can be rented all year round. The blue log cabin, Villa Velhoranta, is luxury cottage which can host also bigger guest groups since it provides 10 sleeping places. 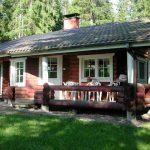 Laskuniemi is a log-cabin cottage with a large loft for sleeping and accommodates 6+2. The sauna oven is heated with wood. 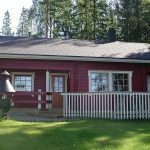 Virranranta is a little “mökki” with a nice and cosy atmosphere and 2+4 sleeping places, electrical sauna oven and a big porch. Have a look at the panorama gallery and make your choice! Just pick a cottage from smaller images below. Please notice that all of the televisions and some other equipment has been updated after panorama shooting.